If you’re looking for a place to celebrate Vegan Pizza Day outside your own kitchen, The Foundry in Westport and Waldo Pizza are your best bets. The Foundry’s Cheat Lovers includes vegan cheese and a yummy crumbled sausage; Waldo Pizza gives you a choice between Follow Your Heart and Daiya cheeses (we recommend Follow Your Heart and make sure they run it through the oven twice so it gets super melty and caramelized around the edges) and a long list of veggie toppings. More on both of these vegan-friendly places soon. 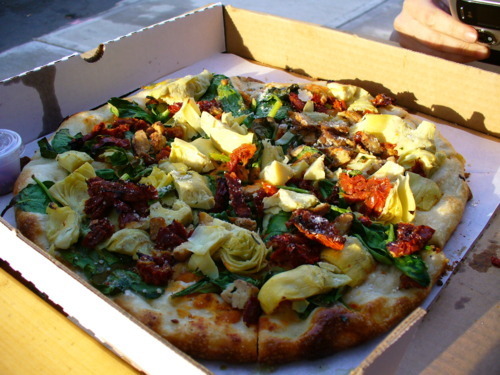 The Informed Vegan: Today is Vegan Pizza Day. Saturday January 29th has been declared vegan pizza day so get your pie on and grab a slice of the good stuff. If you’re going to check out an independent, art, or foreign film in Kansas City, chances are you’re going to Tivoli. And if you’re vegan and going to Tivoli, you should know that 1) their popcorn butter is “butter,” so go wild, and 2) they always have a big selection of Alternative Baking Company’s vegan cookies on display under their counter.